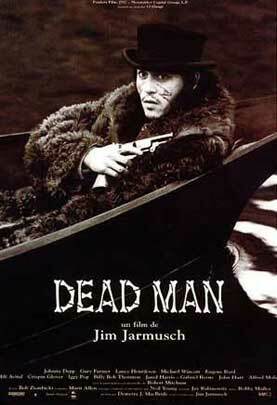 From the very outset, Jim Jarmusch’s Dead Man creates a eerie, strangely doomed tone. A bespectacled Cleveland accountant by the name of William Blake (Johnny Depp) travels by steam train through the wild west circa 1875, nodding off frequently along the way. But each time he awakens to discover a whole new collection of fellow travellers, even though the train doesn’t seem to have stopped. The crowd gets more and more feral as they reach the end of the line, to the point where they all grab their guns and start firing at passing buffalo. It’s got all the markings of a good old, shoot-em-up Western, right down to the casting of Robert Mitchum as the boss of Dickenson Metalworks, the main employer in the desperate frontier town of Machine. Blake was slated to take up a job here but upon his arrival finds the vacancy filled so, with no prospects left, he comforts himself in the arms of the lovely Thel Russell (Mili Avital). Their tryst, however, is rudely interrupted by Dickenson’s son Charlie (Gabriel Byrne) who shoots Thel dead with a bullet that passes through her body and lodges itself next to Blake’s heart. Before copping another one, Blake takes out Charlie with Thel’s gun, thus securing his fate as the titular dead man. With a fatal wound and Dickenson’s hired killers on his tail, his destiny is pretty much assured. On his journey towards his final resting place, Blake is accompanied by Nobody (Gary Farmer), an outcast native Indian American who is convinced that Blake is the famous British poet. Along the way they meet a cavalcade of whacked out characters like Salvatore ‘Sally’Jenko (Iggy Pop in a bonnet and frock) and Big George Drakoulious (a bear like Billy Bob Thornton). And as the body count rises around them, so too does the reward placed on Blake’s head. But inside that head, a mystical transformation is taking place, a preparation for an encounter with the spirit world. Confusing? Maybe. But with its stark, black and white cinematography by Robby Muller and its sparse, electronic guitar soundtrack composed and performed by Neil Young, this film works like a visual poem or a quiet meditation on death.